Should all forms of human cloning be banned? Cloning became a hot issue in this year's presidential race after scientists in South Korea announced that they had created human embryos by cloning, and former first lady Nancy Reagan urged President Bush to reconsider his policies on so-called therapeutic cloning and embryonic stem-cell research. Some scientists think embryonic stem-cell research could someday produce cures for Parkinson's disease, diabetes and other maladies that afflict millions of people, including Alzheimer's disease, which killed President Ronald Reagan. Others say the procedure offers more hype than hope. 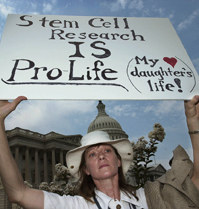 Still others, including President Bush, say the research is grossly unethical because it destroys human embryos. They also fear that therapeutic cloning could lead to human cloning and even the creation of human clones as organ sources. Presidential candidate Sen. John Kerry opposes human cloning but has vowed to quadruple federal funding for embryonic stem-cell research.